Due to... funsized numbers of attendees the third Jugger Ireland tournement was held in Fairview last week, with two teams competeing. Spirits were high and the weather was beautiful despite heavy wind which rendered the use of chains impossible. Two teams were selected and the match was progressing wonderfully until two injuries and one infirmity put an end to the game. Last known score was 6/4 against Mark's team. The game was followed up by a barbeque and good times were had by all. There will be a mini tournement (twice the size of the real one) with the Australians on September 6th at the same location as a warm up for Berlin. As always anyone is welcome. I'm also proud to announce the launch of our new Jugger Ireland website New Website . There is a section there where you can RSVP for the tournement if you don't like facebook. Also anyone who would like a precise address for the tournement email me and I'll send you a Google Maps link, Shona asked me not to post it directly up on the internet. Hope to see you all at the end of June! The Irish Tournement is on the web! Between the 25th and the 27th of June the tournement many of you know and love will be taking place down the countryside in lovely Tipp (where the hell is tipperary? ), so pack your tents! All mod cons will be provided as per jugger custom: a bit of grass for tenting on, portaloos etc. So come one, come all and do us proud! Na geill go bhfaightear sli! 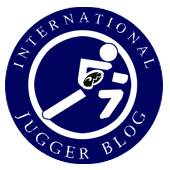 ... the first "true" sports-style Jugger tournament has been done in 1995 in Hamburg?